If you want your business to have a digital presence, the website is the only way. But in case your website is not ranking good in search engines, users will not be able to visit your website. SEO or Search Engine Optimization is a process which is used to rank any website in the search engine. While designing a website, a web designer must keep SEO in mind. However, that doesn’t mean that you have to change the site of your design. It is done to maintain a balance between with web design and SEO. There are multiple techniques which helps you to create a good website along with a good SEO. 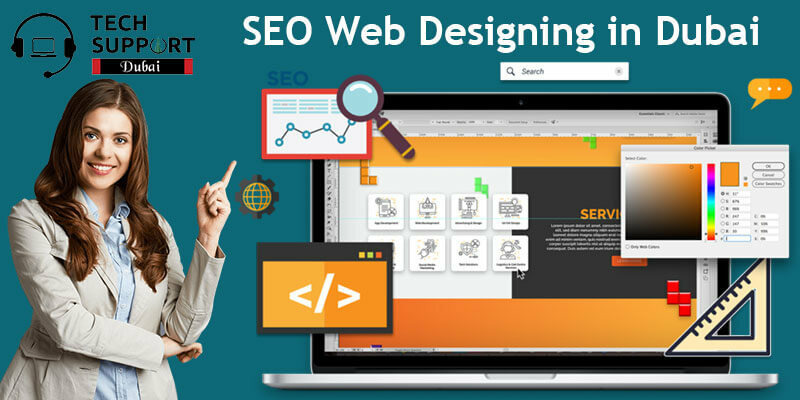 Opt for affordable SEO Web Designing and make your business shine. TechSupportDubai consists of experts who are skilled in various SEO techniques and can guide you in the right way. We have a team dedicated to entirely focuses on SEO work. Your website needs to be seen in the top of search results whenever keyword search is performed. You should be aware of the importance of SEO is in web design and the impact it has on the design process. Content, keyword, and link are essential for SEO success. SEO enables you to get better ranking for your site on the web. If you are looking for the best SEO website designing in Dubai, Tech Support Dubai is the best to choose from. Our experts provide excellent tips that help to improve your web design. We do the SEO work without sacrificing the design of your website. We also design your website to make it search friendly. Why choose our SEO Web Designing Company in Dubai? If you are looking for a good SEO Web designing company, do not worry. You are in the right place. The professionals in our company are creative and efficient. You can easily get full access to our project management system. Our experts have a personalized and consultative approach to your SEO web design requirements. We understand your brand, precise your business needs and then begin working on your project. Hurry and contact us soon to meet your SEO web designing requirements. Your search for reliable SEO Web Designing Services ends with us. Place a call at our helpline number: 042053349 and connect with the experts at Tech Support Dubai. We focus on creating websites which are SEO friendly. Our experts are capable of meeting all your requirements. We are also available via email, live chat or text message. We also provide custom web designing service in Dubai.